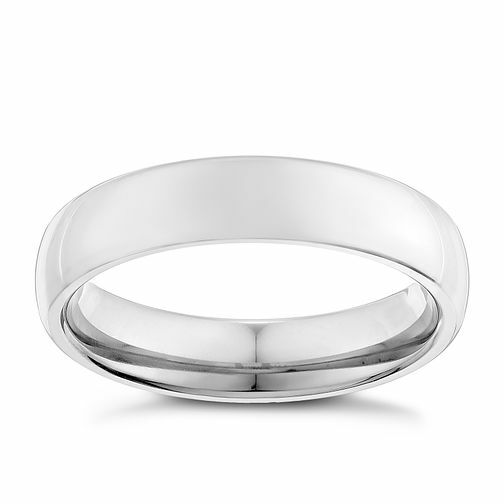 Sleek and simple, this plain 5mm titanium band emanates style. Men's titanium 5mm ring is rated 4.5 out of 5 by 2. Rated 4 out of 5 by Anonymous from Nice ring, but a bit difficult to size My son likes this ring, but took three attempts to get the right size. The online sizing guide gave much too big a size, but staff at your Brighton branch were very helpful in sorting things out in time for Christmas. Rated 5 out of 5 by Anonymous from Great product for the price The ring is stunning and you wouldn’t be able to tell it’s made from a cheaper material. My rings are platinum and they look incredibly similar. Only if my husbands scratch it’s not going to cost thousands to replace. Very happy.